A handful of sites are linking to a post on NetbookNews.de, which links to a post on a UK-based site called IBTimes titled Google Chrome OS-based netbook tech specs are out. It seems fishy and the site doesn’t get a lot of traffic in the first place but if the post ends up being credible, I apologize. The post starts out with “the tech specs of the rumoured Google Chrome OS-based netbook are already out” followed by “tech bloggers have already begun speculating about the netbook’s specs” followed by “The Google netbook, it is reported, will run on Chrome OS…” etc. But where is this being “reported”? And is this information based on speculation by tech bloggers or actual sources? There’s a world of difference there. The post then ends by saying “Now if all of these are true, it’s like getting a Ferrari for the price of a Mini Cooper.” That’s pretty much an admission that none of these specs can be officially confirmed. And let’s look at the actual plausibility of the specs. – Subsidized at $300 or less: Maybe. Google says Chrome OS netbooks “will be in the price range that people are used to for netbooks today.” The Nokia Booklet 3G is subsidized at $300, but that’s about the top of the scale as far as pricing goes. – Sold directly to consumers by Google: Maybe. 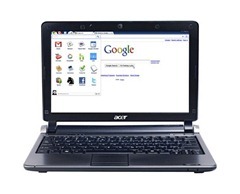 When initially asked about Chrome OS netbook pricing, Google said “You will hear that from our partners.” Recent rumors, however, seem to indicate that Google may be seeking a hardware developer to build a Google-branded netbook. It seems odd, though, that Google would create its own netbook only to then partner with a wireless company to subsidize the price of it and that such a product would be sold directly by Google and not also in the wireless carrier’s retail locations. – NVIDIA Tegra platform with ARM CPU: Plausible, likely. – 10.1-inch TFT HD-ready multi-touch display: Not likely to get multi-touch for $300. If it’s indeed being subsidized, multi-touch is a possibility. – 64GB solid state drive: This is the biggest red flag, as far as I’m concerned. Everything is supposed to be “in the cloud” with this platform. Maybe a 4GB or 8GB solid state drive. There’s no use for a 64GB drive and it’d add to the overall cost of the netbook. – 2GB of RAM: Likely. – Wi-Fi, 3G, Bluetooth, etc. : Plausible, likely. Now it’s entirely possible that these could be the specs for a particular vendor that’s intent on selling a Chrome OS-based netbook, but the idea of a flagship Chrome OS netbook with a 64GB drive and subsidized price tag sold directly by Google to consumers seems unlikely.